The passion for cricket is a joy to behold and there is no doubt that Bal Bhavan International School, has incorporated this passion. The school has always provided a huge platform to the young cricketers. Today, 6thApril, 2015 marked as a historic day for BBIS as we are heading towards another milestone in the area of cricket. On this day the school in collaboration with GMR Sports(Delhi Daredevils) inaugurated the Delhi Daredevils Bal Bhavan Academy. 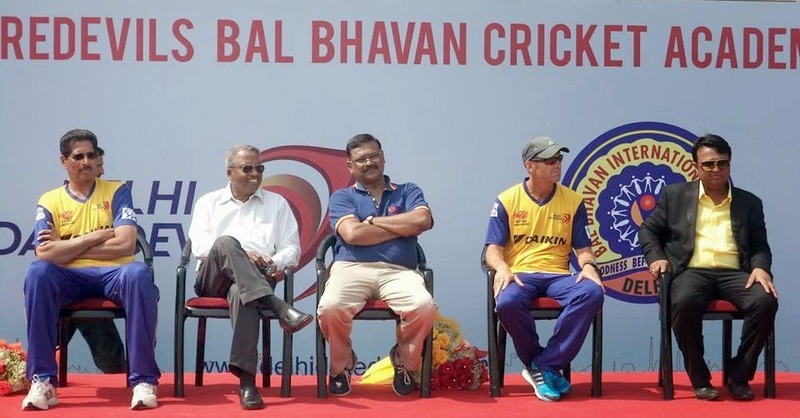 This notable event was graced by Mr. Sunil Walson, Indian Team Member of 1983 world cup winning squad, Vice President Delhi Daredevils, T.A Sekar, Former Indian Cricketer, Bowling Mentor Delhi Daredevils, Mr. Gary Kirsten, Head Coach Delhi Daredevils,PravinAmre, Sridharan Sriram, the faculty members and the renowned players from DD Team: Zahir Khan, Amit Mishra, Mohammad Shami, SaurabhTiwary, Gurinder Singh, Angelo Mathews, Quinton De Kock, Imran Tahir. The event was hosted by our imperial management members, Mr. Deepesh Gupta, Manager, Bal Bhavan International School, Mr. Jay Gupta, Manager, Bal Bhavan International School, Sonepat, Gannaur, Mr. Kunal Gupta Principal Bal Bhavan International School, Dwarka and Ms. Jaspreet Kaur, Vice Principal BBIS, Dwarka.Sharadh Sinha, DCP also graced the occasion. It is a huge undertaking but also has a strong support of Delhi Daredevils Management members and the cricket council. A joint venture with Bal Bhavan International School will definitely lead to success. The school will surely witness cricketers of the highest quality over the course of training in the academy. नव वर्ष 2014 मंगलमय हो …….